Hey! My salutations have been gate crashed! Why should we welcome this confident new arrival? Words and turns of phrase have come and gone over the course of my life, driven by tech, media or the need to describe a new social circumstance. I barely noticed this particular interloper until US based AirBnB put the word right into my mouth. “Hey”. I said (apparently) “My name is Julia”. And there was my photo and a short biopic on the newly formed profile. Up to that point I had perceived ‘hey’ as a millennial buzzword but it turns out “Hello” and “Hi” carry a surprisingly similar etymology. All represent a shifting blend of call for attention (that’s anything from calling hunting dogs to hailing a ferryman) with the potential to morph into an emphatic greeting at any moment. The old high German language that contributed so much to middle English gave us “Hei”, “Hai” and other variants that were to become the great grand parent of all three words. Similar forms cropped up, probably from this root, in many Germanic countries and across Scandinavia. Hardly surprising this breezy and seemingly modern greeting made itself so readily at home in our Cornish corner of western Europe. More recent developments are also similar. Both Hi and Hello are perceived in Britain as Americanisms though they too share the old English ancestry carried to the new world by migrant Europeans. Hi was first attributed to the speech of a Kansas Indian (addressing an audience in English) in 1862 in the southern states of the US from whence it spread North, becoming accepted across America during the second half of the 20th century. 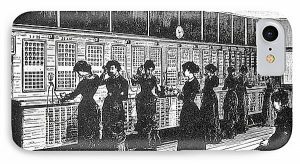 Hello became dominant with the advent of telephones when early exchange workers were introduced as “the hello girls” as recently as 1889. I personally remember the ‘correct’ spelling of Hello remained surprisingly flexible in the UK until around 1980 as it displaced the older forms hallo or Hullo. This brings us to my favorite theory: that phonetically similar forms meaning the same thing (or very similar) consistently turn up across the world and in entirely unrelated languages, Finnish Hei, Unami He’ or mandarin Chineses āi for example. So do I object then to this cheeky and increasingly prolific three letter vocab’ bomb? who could ask more of a word? Successfully launching from the wood shelter roof to the open bedroom window of our assistant hospitalero in search of chocolate. Investigating the plug-in ultrasonic rodent deterrent with an air of utter contempt. After two very full days I am happily sitting in the twilight, watching the solar powered lights come on one by one at Eden’s Yard Backpackers which is nestled in St Austell. After a hearty meal, cooked to perfection by hosts Neal and Julia I reflect on my dream like experience in Cornwall.As a South African I was at first enticed to Cornwall in the hope that I might check out the surfing vibe. However, I came to realize that Cornwall has much more to offer. So instead I decided to visit the gardens and beaches. The Eden Project is a short walk up the road from where I am currently sitting now watching a horse and rider clip clop past. This Eden project is astounding and an exhibition of creative ingenuity, recycling and love for nature. What once was a clay pit waste land has been transformed into a living Eden with two biomes; a rainforest biome with humidity and fully grown trees, as well as a mediterranean biome. Plants from all over the world are grown here and I had a laugh when I spotted fynbos, which is proudly South African. The gardens around the biomes are sculptures, exquisitely designed, and the stage situated in front of the biomes boasts many great performers and acts. The next day I planned, with the help of Julia, to the Lost Gardens of Heligan. Here a short walk down from the backpackers to the main road enables you to hop on bus 24 to Pentewan. A frolic in the beach sand and splash in the somewhat chilly water at Pentewan is much enjoyed before hoping back on the bus 471 to the gardens. WOW!! There are no words to describe the gardens. Think of the secret garden, with magical sculptures and a jungle mixed into one…. Exceptional beauty, I have never felt so at peace and zen before. What an incredible experience! A MUST for any one!! 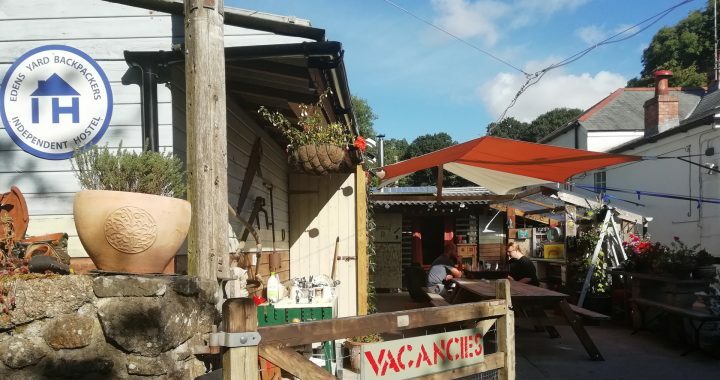 The hostel is situated to the west of Eden, on Route 2 of the National Cycle Network – Eden’s Visitor Centre is just 500 m to the east, as the crow flies! Walking and cycling routes in the St Austell Bay area enjoy some beautiful countryside. The cusp of cycle routes 2 & 3 is just 250 m north of the hostel and also the nearest point on the Clay Trails. The Trails were built in conjunction with Sustrans and are suitable for both walking and cycling with much of the network off road. The explorer may follow them inland over the high ground or to the coast at Carlyon Bay or Par, just 3 km to the south and 4 km to the south east, respectively. The Saints Way is an ancient pilgrimage route from Padstow to Fowey and the nearest point is 2 km to the east, on the other side of the Eden Project. Maps of all these routes are available on the Internet or alternatively, we have map leaflets at the hostel. Cycle hire is also available via our partners at Cycle Point and cycles can be delivered to the hostel.